The advantage for customers is that they are made aware of potential problems or imminent failures, and can plan corrective actions around their normal shutdown periods. This approach is less disruptive to their businesses, and more cost-effective than unscheduled or unplanned downtime. “SEW is able to work with customers to carry out preventative maintenance or supply replacement units on short notice to maximise plant uptime,” Pretorius stresses. 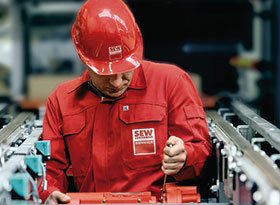 The value-added services are applicable to SEW’s extensive gearedmotor and industrial gear product ranges. While SEW-Eurodrive South Africa has already been offering such value-added services to some of its larger customers, the plan is to roll it out to all customers. In addition, SEW is in the process of incorporating these value-added services into formal service contracts for customers to ensure their maintenance and condition monitoring is performed by skilled technicians with specialist knowledge in the transmission industry. Pretorius highlights that the Field Service Department has grown significantly in the past year. “On the electronics side, we have just completed a major project for an automotive manufacturer that has extended its plant for the assembly of its latest model. We are currently busy at another automotive manufacturer, upgrading its entire plant with innovative, safe, and energy-efficient concepts and products from our comprehensive modular system of drive elements. “We focus on energy efficiency and safety technology in particular, with products designed specifically for this purpose, making us an ideal partner. Our Field Service Department has highly-trained technicians, and we are able to draw from our skills and knowledge globally as and when required, meaning our scope of service and benefit to the customer is unparalleled in the industry,” Pretorius highlights.